The Misen Chef’s Knife offers the versatility of a high-end chef’s knife at an affordable price. It can debone with precision, make easy work of a gourd, and slice, dice, and chop its way through anything in between. Save over 15% with promo code GIZMODOMCK and get yours for $59, shipping included. The Misen is a Japanese-Western hybrid. It takes on the curvature of a western blade, with the thinner and lighter weight body of a Japanese knife that supports multiple cutting techniques, whether it’s a slice, rock, or chop. And with the blade at an acute 15 degree angle, it has a noticeably sharper cutting face. Made with AICHI AUS-8 steel, the Misen offers a balance of sharp edge retention and durability. And with a sloped bolster that travels gradually onto the blade face, it provides an comfortable hold for every hand, and encourages the proper “pinch grip” for better control. 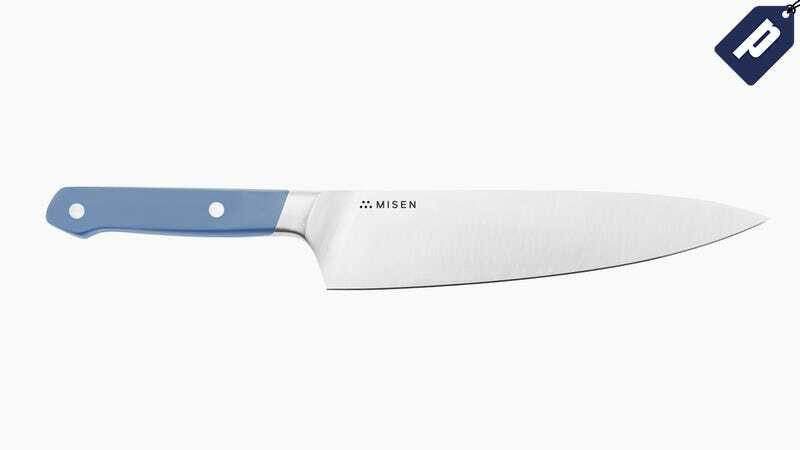 With a razor sharp blade and a well-balanced weight, the Misen is the honestly priced Chef’s knife for casual and professional cooks alike. Save over 15% on yours with promo code GIZMODOMCK and get it for just $59.